The launch vehicle lifted off from the Baikonur Cosmodrome on 14 September 2015 at 22:00 msk. On 15 September 2015, at 04:37, the spacecraft separated from the upper stage. At this time, the Express-АМ8 is under the control of RSCC specialists for subsequent checkouts of its functionality, testing of all systems, and commissioning for operations. The new Express-АМ8 will be stationed in the geostationary orbit at 14˚W to provide state-of-the-art communications and broadcasting services to users in European Russia, Europe, Africa, the Middle East, and Latin America. 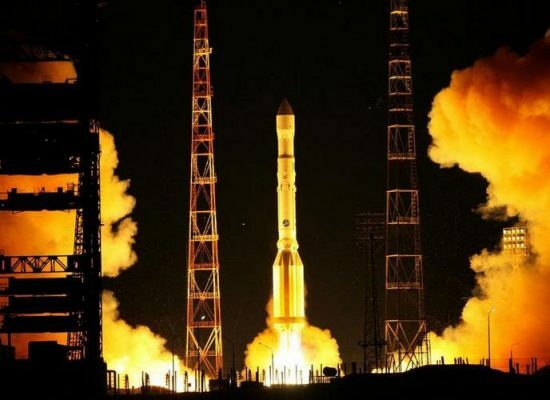 Proton-M/Block DM-03 successfully placed the Express-АМ8 satellite into a geostationary orbit. The launch vehicle lifted off from the Baikonur Cosmodrome on 14 September 2015 at 22:00 msk. On 15 September 2015, at 04:37, the spacecraft separated from the upper stage. At this time, the Express-АМ8 is under the control of RSCC specialists for subsequent checkouts of its functionality, testing of all systems, and commissioning for operations. At this point, scheduled operations are under way to deploy onboard equipment. The new Express-АМ8 will be stationed in the geostationary orbit at 14˚W to provide state-of-the-art communications and broadcasting services to users in European Russia, Europe, Africa, the Middle East, and Latin America. The Express-АМ8 spacecraft was ordered and funded by RSCC, and manufactured by АО ISS-Reshetnev Company under the Federal Target Program entitled Development of TV and Radio Broadcasting in the Russian Federation in 2009-2015. The satellite has an active lifetime of 15 years. It is equipped with transponders in the C-, Ku-, and L- bands.